I’m sure you’ve heard all about the beloved Revere Pewter! By far Benjamin Moore’s most popular and searched colour, and for good reason, this colour is here to stay. When gray became the trend a few years ago the transition from the previous trend of honey beiges and chocolate browns to grays wasn’t an easy one. Mixing these two worlds can be tricky (note: if you have honey oak cabinets and cherry wood floors, approach painting your walls gray with caution). But it seems that the one fix to that, over and over again, is the so very loved HC-172. And there are a few reasons why it’s a default go to in tricky situations, and why it’s never failed me! I’ve always called Revere Pewter the chameleon colour because it’s a colour that appears differently on every wall, different in every room, and feels like it’s always changing. Revere Pewter really shines when updating a previously beige/brown toned space. Everyone wants to jump on the gray train and join the trend. 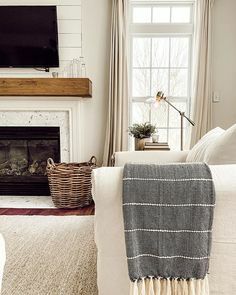 But if you have chocolate brown furniture, or honey oak cabinets, or earth toned rugs, it can be difficult to incorporate trendy grays into this existing palette. Revere Pewter is a perfect transition into gray because it’s so warm and brings symmetry to the two worlds. This brings me to the next biggest point: do not choose this colour if you’re wanting freshness! Revere Pewter is a warm muddy gray. On the opposite end of the spectrum, you can find grays that are fresh and cool-toned and work in a completely different way (post coming soon on cool-toned grays!). This is why some people find it too murky of a colour – it works wonders alongside taupes and creams, but if you’re envisioning more of a modern steel gray, look elsewhere my friend! Lastly, I’m a firm believe that Revere Pewter can be the perfect whole-home solution. Because it can be swayed by its surroundings, it’s a versatile colour that works harmoniously with almost anything it’s paired with. As I said, because it’s a warm gray my personal favourite is to pair it amongst other warm tones. This is the gray to choose if you have existing beige furniture, rugs, curtains, etc. and I think it looks best in a comfy and neutral home (as apposed to modern and fresh). Have you used Revere Pewter in your own home? If you’re looking for colour help, visit the Colour Consultations tab at the top of the page to read more about my online colour consulations! I just painted most of my (small) home with Simply White on the walls and Revere Pewter on the trim…I absolutely love it! I have used Revere pewter down in my basement and it gives me that dark gray that I love. I also have it in my kitchen, office, laundry room. My kitchen faces North and the color takes on a blue gray. In my office and laundry room which also are in the North side take on a brown gray. The color changes with the light that comes in through the windows. Revere pewter is a tricky color. I just painted my entry hall, formal living room and dining room in revere pewter. It was not what I expected. It doesn’t have the greige or green undertones that I wanted. The dining room actually looks like light lavender. I thought it may have been mixed differently but I had two different samples at different places and compared them, they were the same. I won’t use this color again. I couldn’t agree more! I painted my family room walls Revere Pewter and the accent wall with the fire place Chelsea Gray–I don’t like it at all. The walls look brownish beige. Not at all what I wanted. I do, however, love the Stonington Gray I used in another room. I love that i found this post! I am in the process of covering the whole house in Revere Pewter with Simply White Ceilings and Trim. I have currently had it mixed at 50% which looks mych better in two of my rooms with brown trim. My golden oak well worn cabinets need a complimentary color. My husband has not agreed to white. Is there a grey or alternate color you recommend. Replacing counter tops with a white gray black marble look. Revere Pewter + Simply White are a match made in heaven. 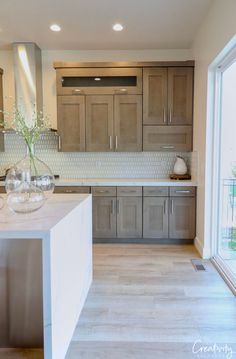 If your counter tops are going to have gray in them then I would try to find a shade of that gray for the cabinets so they’ll really compliment one another! We are building a semi detached. I have revere pewter now and love it. Should I use the same paint color throughout the whole house. If not, what colors complement revere pewter. And I would like just a hint of gray in my kitchen cabinets. The wall would be revere pewter. Any suggestions for cabinet colors? Thank you! I’d suggest considering one of the colour consultation packages that I offer so I can properly answer each of these questions! I do love Revere Pewter for a whole home solution though, especially if you’ve used it before and you’ve loved it – you can’t go wrong. We used Perfect Taupe (Behr) in our keeping room, kitchen and breakfast area, which is a very warm gray. Next, we moved on to the bedrooms and bathrooms using Ancient Marble and Skyline Steel. When we got to the two story foyer, staircase, hall and great room, we were at a loss. Trying to get a “neutral” gray color that would blend with our other choices was proving to be difficult. We ended up hiring a painter because of having 18 foot ceilings which were beyond my comfort zone. He recommended Revere Pewter and it was truly a perfect choice. Any idea how this color compares with Behr’s Sculptor Clay? They seem similar but I’m wondering if they are, indeed, interchangeable. I’ve never used Sculptor Clay but after a quick Google search, they look pretty dang similar to me! I’m not sure about Sculptor Clay, but I colour-matched Revere Pewter to Behr’s Burnished Clay. I’m in Canada — maybe the same colour is called Sculptor Clay in the U.S.? I decided to go With BEHR sculptor clay throughout my first floor, as it is very close match to revere pewter! The only difference is that Behr is more cost efficient & the sculptor clay is maybe 25% lighter than revere pewter but seriously looks the same in tone & swatched on the wall!! I like sculptor clay a bit more as it felt clean & bright. It’s about as close as you can get! I have this throughout my home along with Castle Path (also Behr) . I’ve painted my guest room, office and laundry room Revere Pewter. It is my fav color of all time. I love soothing neutrals, mixing greys with other muddys lol. I mix in texture, dove white trim, warm wood floors, and create heaven lol. I find my guest room stays consistent in coloration. My office leans toward grey green at times and my laundry room is just a perfect looking grey. Not a blue grey. Not a purple grey. Maybe a brown grey? But until you compare it to a cool grey, it just looks lovely me a pretty “grey” lol. Warm and fabulous. It depends what you’re pairing it with and which direction your room faces as well. I painted my livingroom edgecomb gray as I wanted a backdrop that showcased my furniture and didn’t overly show off itself. Obviously it’s not for everyone but it is my number one. Great post btw! In the middle of using it for the whole house – love love love it! The fact that it changes colour depending on the light keeps things interesting. Since we are doing rooms one at a time (when we can get to them) it has the added bonus of going well with just about any existing colour – so the house in transition looks just fine! What is your opinion with this color with cherry wood, red cherry- two main rooms have the south walls are windows. By living room has like a wainscoting cherry and cherry beams on ceiling. All kitchen cabinets are cherry. I painted almost my entire home in Southern California in Revere Pewter. The tow darkest rooms (guest bath and kitchen) I went with edgecomb gray. Absolutely love the way the house turned out. When trying to decide on an exterior color we finally realized why not just go with this color we love, so our exterior is Revere Pewter! It looks incredible! Has anyone used Revere Pewter on the exterior of their home? I have selected it for my exterior siding, with White Dove trim. I have painted a small section and love it. Any thoughts or pictures? Thanks! 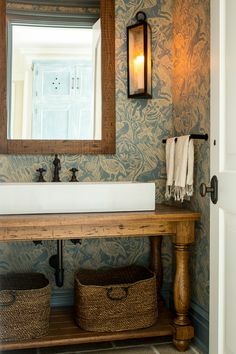 In my search for paint color for my entry, family room and hallway, I came across so many posts praising Revere Pewter. In the photos it looked like a beautiful light greige. Your comment calling it “murky” caught my eye because when I purchased a sample can and put test swaths on my walls it looks like tan/mud! Definitely not what I was looking for. I decided on Sea Salt instead – talk about a color changing paint! Sea Salt is such a beautiful colour and you’re right, it’s much cleaner looking than Revere Pewter! All depends on what you’re looking for! How do you like the sea salt? We used sea salt in our main bath without a window. It is so fresh and just the look we wanted! It looks much different than it did on my ipad-but so pretty with my sea glass collection. I absolutely LOVE Sea Salt in my kitchen. Such a color changing wonder. I have it on the walls with medium oak floors, furniture, and cabinets. The ceiling is light gray. Magical combination! Sometimes gray, robin’s egg blue, sometimes gray-green, greige, etc. Wonderful liveable color! Use it anywhere! Would you use Revere Pewter with yellows such as Farrow and Ball’s Dorset Cream? I need a color that can be used in the hallway and up the back stairs. I have wainscoting in the hallway painted with White Tie. Thank you! We had our whole home painted in revere pewter, lots of different rooms and lighting, it looks like we have perfectly matched a whole range of colours. I love, love it even three years later. Definitely needed two coats though, one coat was an entirely different hue. Goes perfectly with our dark wood floors too. We have used Revere Pewter since 2003 with the painting of the exterior of our homes. In fact, we are in our third Florida home in 2018 and each home we had painted in the revere pewter has received great compliments from our neighbors and visitors! It is not that we are not familiar with the spectrum of available colors of Benjamin Moore. Revere Pewter gives the welcoming warmth and the sophisticated opulence we are very pleased to present our homes. The trims are always of a coordinating BM complementary paints. This time we are going with a trim of white 75% cut of Revere Pewter. BM’s Revere Pewter performs extremely great in the Florida sunshine state! Hi! I’m building a new home it’s a country like cabin. I have chosen revere pewter for my living room with white trim. However there is no stopping point into dining area and kitchen. My cabinets are artichoke green. Your thoughts? Cabinet tops are black and grayish/white. I tried revere and it was to Dean in my kitchen. Went with the lighter edgecomb gray and absolutely love it. Did a good share of house in edgecomb with simply white trim. Beautiful! I am a landlord and I use revere pewter in all of my rentals. 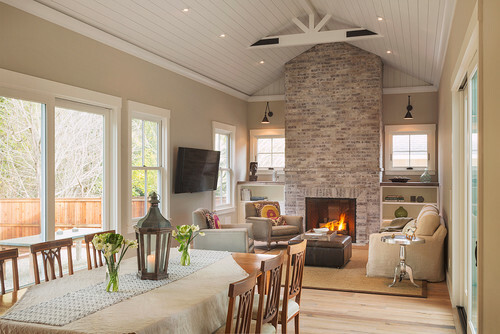 It has a modern feel with white trim but at the same time it is also peaceful and calming. I adore it and have had a real good response from renters. About 3 years ago I used Revere Pewter along with white cabinetry and woodwork in the kitchen and breakfast nook of our house that we sold earlier this year. I love that color so much, those two rooms where the sunniest in the whole house and I loved how the color changed with the light. I’m trying to figure out where to incorporate it in my new house. I also used BM Soft Fern in our old home and plan on using it in this house too, it’s a soft muted green and we had tons of compliments on the color and looks beautiful with gray, aqua and teal. I painted my living room Revere Pewter. I have light grey sofas with a navy and salmon Company C “Old Glory” rug. I would like to put up sheers but cannot find the right shade. Thoughts? I picked Revere Pewter because of its versatility. 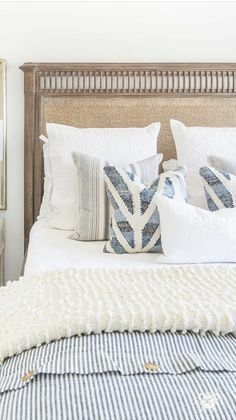 I used it in my bedroom because I love changing my bedding to all different colors and wanted a nice neutral color that would match everything. In early morning light from an east facing window it looks gray but in the evening it looks more beige. I also used it in a half bathroom downstairs with no windows. It’s paired with a lot of light blues and it looks completely gray in there. I absolutely love this color.